ROME - When Pope Francis travels to the United Arab Emirates Feb. 3-5, he will meet with the international Muslim Council of Elders, participate in an interreligious meeting and celebrate Mass for the local Catholic population, the vast majority of whom are foreign workers. - 1 p.m. (7 a.m.) Departure from Rome’s Fiumicino airport for Abu Dhabi. - 10 p.m. (1 p.m.) Arrival at the Abu Dhabi Presidential Flight airport. Official welcome. Pope Francis has conferred the 'Commenda con Placca dell’Ordine Piano' upon Dr. Mohamed Mahmoud Abdel Salam, former councillor of the Grand Imam of al-Azhar, in gratitude for his work in strengthening relations between al-Azhar and the Catholic Church. “His Holiness Pope Francis has benevolently granted the honour of ‘Commenda con Placca dell’Ordine Piano’ to His Excellency, Dr. Mohamed Mahmoud Abdel Salam, former councillor of the Grand Imam of al-Azhar, for his excellent work for interreligious dialogue and that of strengthening the relations between al-Azhar and the Catholic Church. Pope Francis prays the Angelus prayer with pilgrims gathered in St. Peter’s Square on Sunday, and reflects on the gratuitousness and universality of salvation in Jesus Christ. Reflecting on the day’s Gospel (Lk 4:21-30), Pope Francis explored the reaction of Jesus’ compatriots that Jesus himself is the one on whom the Spirit of the Lord has descended and has sent to carry out God’s mission of salvation for humanity. They are skeptical of Jesus’ claim, said the Pope, and demand he work miracles in their midst. Jesus, however, refuses. Pope Francis begins his Apostolic Journey to the United Arab Emirates, departing from Rome's Fiumicino Airport. Immediately following the Sunday Angelus prayer, Pope Francis headed out to Fiumicino Airport to begin his 27th Apostolic Journey abroad. But before boarding, the Holy Father made a brief stop at a homeless shelter set up at the airport and promoted by Aeroporti di Roma and Caritas of Porto-Santa Rufina. He greeted those assisted by the project, which began in 2017 and carries the name, "Life in transit: the human face of an airport". Pope Francis then boarded the Alitalia Boeing 777, which took off at 1:27 PM. The papal plane arrives in Abu Dhabi around 10:00 PM local time (7:00 PM Rome time). Pope Francis greeted the journalists accompanying him to Abu Dhabi aboard the papal plane. The Pope was introduced by the words of the interim Director of the Holy See Press Office, Alessandro Gisotti, who said: “Holy Father, it seems like yesterday - it almost was yesterday - that we were on the flight back from Panama. Among the many welcome posters there was one from the Muslim community of Panama that read: ‘Welcome Pope Francis, man of peace’, in Spanish. It is with this spirit that I believe they await you in the Emirates, as a man of peace, to strengthen dialogue”. The Pope first thanked the journalists for their presence, then added: “This morning I received news that it was raining in Abu Dhabi, and there it is thought of as a sign of blessing. Let’s hope that everything goes like that”. Pope Francis continued, saying: “I brought each of you an icon made in the monastery of Bose, a copy, so that you can take it home. It’s on the theme of dialogue between the old and the young. I care deeply about this topic, and I think it’s a challenge”. - Noon (3 a.m.) Welcoming ceremony at the entrance to the presidential palace. - 12:20 p.m. (3:20 a.m.) Official visit with the crown prince, Sheikh Mohammed bin Zayed Al-Nahyan, in the presidential palace. - 5 p.m. (8 a.m.) Private meeting with members of the Muslim Council of Elders in the Sheikh Zayed Grand Mosque. - 6:10 p.m. (9:10 a.m.) Interreligious meeting at the Founder’s Memorial. Say what you like about the opulence, but one thing is for sure: the Emiratis know how to put on a welcome ceremony and Pope Francis was certainly treated to the full shebang. I could see it coming: having lived in Italy for many years I can say I am quite accustomed to the beauty of Carrara marble and exquisite art work, but never have I seen such a lavish use of precious marble, crystal chandeliers, towering domes, and gold decorations of all shapes and sizes. Such a historic visit as this, along with the attention of the international media, provides a unique occasion to show the world how guests are welcomed and pampered in the United Arab Emirates. For days the acrobatic pilots of a special air team practiced their aerial acrobatics above the bay. Today, they greeted Pope Francis from above, spurting trails of yellow and white smoke in honour of the Vatican colours. The papal motorcade itself was accompanied by over a dozen horsemen on beautiful Arab stallions. They made their way through perfectly manicured lawns and wide avenues carrying Vatican and UAE flags. I invoke upon Your Highness & all the people of the UAE, the divine blessings of peace and fraternal solidarity”. Pope Francis has become the first pontiff to cross the threshold of Abu Dhabi’s Sheikh Zayed Grand Mosque. The pope arrived just after 5pm on Monday and was met by Dr Ahmed Al Tayeb, Grand Imam of Al Azhar and chairman of the Muslim Council of Elders. The meeting between the two religious figures representing Roman Catholicism and Islam was a powerful moment. Not only is the mosque a place of worship, it is also the burial place of the country's Founding President, Sheikh Zayed. Despite some forecasts of rain, mainly blue skies stretched over the city in advance of the visit. Along the roads leading to the mosque, papal and UAE flags fluttered in the breeze and a sense of history hung in the air. At the mosque, security was tight, with police and the army guarding access to the building. Pope Francis arrived in his understated Kia amid a convoy of dozens of police cars, while three helicopters hovered overhead. The evening sun cast a warm glow over the mosque’s white marble as he stood with Mr Al Tayeb outside the entrance before they then went inside for a private meeting. 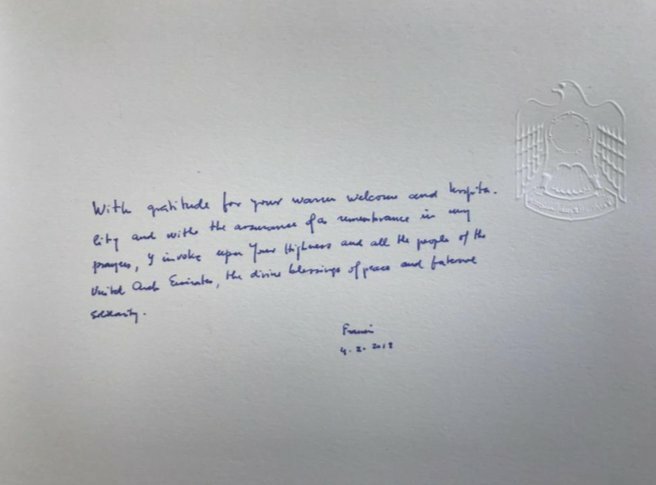 Pope Francis addresses the Human Fraternity Meeting at the Founder’s Memorial in Abu Dhabi on Monday, and confirms how, “God is with those who seek peace”. Monday’s Interreligious Meeting took place within the context of the Global Conference of Human Fraternity, currently underway in Abu Dhabi. The Conference has brought together hundreds of religious leaders and scholars. It is dedicated to examining interfaith dialogue, religious freedom, combatting extremism, and promoting peace. All of these themes were present in Pope Francis’ discourse, which he delivered at the Founder’s Memorial, before some of the highest authorities in the United Arab Emirates, and members of the Diplomatic Corps. Pope Francis began by describing himself as “a believer thirsting for peace”. Speaking about the Interreligious Meeting itself, the Pope continued: “We are here to desire peace, to promote peace, to be instruments of peace”. - 9:15 a.m. (12:15 a.m.) Private visit to the cathedral. - 10:30 a.m. (1:30 a.m.) Mass at Zayed Sports City. - 12:40 p.m. (3:40 a.m.) Farewell ceremony at the Presidential Flight airport. - 1 p.m. (4 a.m.) Departure for Rome. - 5 p.m. (11 a.m.) Arrival at Rome’s Ciampino airport. On February 5, 2019, before leaving the residence, Pope Francis greeted the staff of Al Mushrif Palace, the apostolic nuncio in the United Arab Emirates and the apostolic delegate for the Arabian Peninsula, Archbishop Francisco Montecillo Padilla, with family members, and a group of Capuchin Friars and priests of the vicariate, accompanied by Bishop Paul Hinder, O.F.M. Cap., apostolic vicar of Southern Arabia. He then transferred by car to St. Joseph’s Cathedral, one of the two Catholic Churches of Abu Dhabi. Upon arrival, the Pope was greeted by the apostolic vicar of Southern Arabia, the vicar general, and the parish priest. Then, while a hymn was sung, Pope Francis entered the Cathedral in procession, where he was awaited by a representation of the Catholic community made up of around 300 faithful. Bishop Hinder presented the community of faithful present to the Pope who, addressing a brief greeting to them, affirmed that for him it is a great joy to visit young Churches such as the one present in the Emirates, and thanked the faithful for their witness. Alessandro Gisotti, interim director of the Holy See Press Office: Good afternoon, Holy Father. Good afternoon to you all. We journalists frequently use the adjective 'historic,' and at times they tell us we use it too often. Maybe for this trip we used it well and many used it in different languages. Truly a short trip in length but with a really long horizon, and all hope that the fruits and the seeds of these days will be long-lasting. Clearly a trip, as was seen today a few hours ago, a meeting with a people... of many peoples. The organizers were saying around 100 nationalities were present. And then yesterday this [joint] document, obviously extraordinary, valuable. A surprise, but I imagine one of those surprises that is a pleasure for colleagues to recount for its importance. I do not know if before the questions, Holy Father, you want to address some words? Pope Francis: First of all, hello, thank you for the company. It was too short of a trip, but for me it was a great experience. It’s that I think that every trip is historic, also each of our days, to write the story of every day... no story is small, every story is big and worthy even if [judged to be] bad, the dignity is hidden, can always come up. Thank you so much for your collaboration. Vatican City, Feb 6, 2019 / 11:34 am (CNA).- The Vatican clarified Wednesday Pope Francis’ comments on the sexual abuse of women religious made during his in-flight press conference returning from Abu Dhabi Feb. 5. ROME - The Vatican announced Wednesday that Pope St. Paul VI’s feast day will be celebrated annually on May 29 as an optional memorial. The date of the memorial, May 29, is significant in that it is the ordination anniversary of Paul VI - then Giovanni Battista Montini - to the priesthood in 1920. Just four years later, Montini began his service to the Holy See, serving both Pope Pius XI and Pius XII. He was made Archbishop of Milan and then a cardinal before being elected pope in 1963.